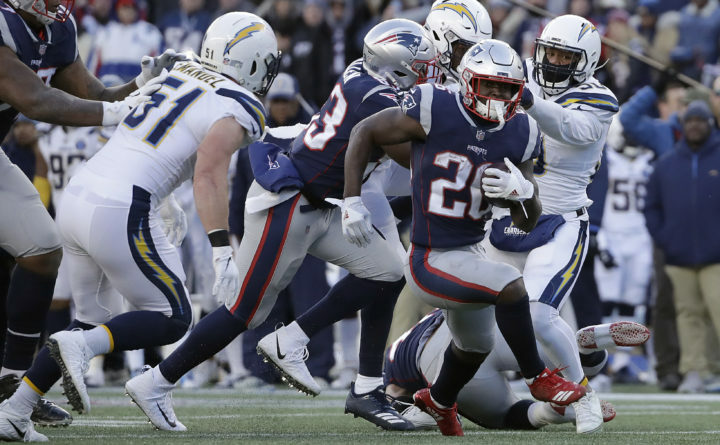 New England Patriots running back Sony Michel (26) runs from Los Angeles Chargers outside linebacker Kyle Emanuel (51) during the second half of an NFL divisional playoff football game Sunday in Foxborough, Mass. Rivers seemed poised to keep Los Angeles in the game, connecting with Keenan Allen for a 43-yard score on Los Angeles’ first possession. It was the longest touchdown of Allen’s career, including the postseason.